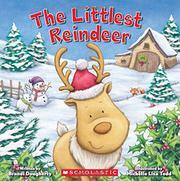 Dot, the smallest reindeer at the North Pole, is too little to fly with the reindeer team on Christmas Eve, but she helps Santa in a different, unexpected way. Dot is distressed because she can’t jump and fly like the other, bigger reindeer. Her family members encourage her and help her practice her skills, and her mother tells her, “There’s always next year.” Dot’s elf friend, Oliver, encourages her and spends time playing with her, doing things that Dot can do well, such as building a snowman and chasing their friend Yeti (who looks like a fuzzy, white gumdrop). On Christmas Eve, Santa and the reindeer team take off with their overloaded sleigh. Only Dot notices one small present that’s fallen in the snow, and she successfully leaps into the departing sleigh with the gift. This climactic flying leap into the sleigh is not adequately illustrated, as Dot is shown just starting to leap and then already in the sleigh. A saccharine conclusion notes that being little can sometimes be great and that “having a friend by your side makes anything possible.” The story is pleasant but predictable, with an improbably easy solution to Dot’s problem. Illustrations in a muted palette are similarly pleasant but predictable, with a greeting-card flavor that lacks originality. The elf characters include boys, girls, and adults; all the elves and Santa and Mrs. Claus are white.